Jouane Manette is an elderly Breton mage living in Rorik's Manor in Rorikstead. Jouane was a healer for the Imperial Legion during Great War, during which he met Rorik when he was brought in from the battlefield, heavily wounded from an engagement with an Aldmeri soldier. Jouane managed to keep him alive, and the two became fast friends. Rorik would later found Rorikstead, and let his savior live with him. Jouane is secretly teaching the local child Sissel the art of magic. Jouane Manette wears a set of fine clothes with a pair of fine boots. He also carries a belted tunic, but won't wear it. He wields an iron dagger and carries a copy of the key to the manor. Jouane starts his day by getting out of bed at 8am. After waking up his first stop for the day will be Frostfruit Inn. 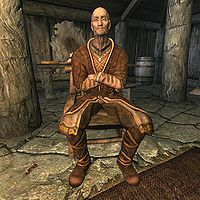 He will remain at the inn until noon, when he will leave the inn to roam around Rorikstead until 6pm. At 6pm, he will meet with Sissel at the manor for training. The two will spend the next two hours together, until their covert meeting breaks at 8pm. Now done with Sissel's training for the day, he will return to the inn for the last few hours of his day, staying there until he heads home for bed at 11pm. If you speak to or approach Jouane, he will greet you in a number of ways. Many of his greetings contain remarks on the excellent land at Rorikstead, and how they do not want any conflict: "If you're thinking of setting up to farm, you picked the right place." "Peace and prosperity are all the good folk of Rorikstead want in life." "Do enjoy your time in Rorikstead. This close to the Reach, well, we are truly blessed to have such fertile ground." He will also make allusions to his past every now and again: "I'm sure it's hard to believe, but I was once a bold adventurer like you, ready to face any danger." If you have yet to resolve Erik's quest to become an adventurer, he will direct you towards him: "Have you spoken to Erik? His father won't let him go out and seek his fortune in the world. Maybe you can help." You can ask Jouane Manette a few questions about his past, Rorikstead, and how they will deal with the dragons. "How did a Breton like yourself come to dwell in Rorikstead?" "Have you met Rorik? He owns these lands, and it's from him that our village gets its name. We have been friends for many years now. Rorik fought for the Empire in the Great War. He was gravely wounded, and so was brought before me. I was a healer then, you see. We were as close as kinsmen, and when Rorik returned home I came with him. I am happy to spend my twilight years here with my good friend." "Your farms are thriving, even despite the harsh climate. What's your secret?" "Secret? What makes you think there's a secret? There are no secrets here, my curious friend. Our prosperity is simply the result of hard work, good fortune and the blessings of the gods." "How will you protect yourselves against the dragons?" "How can we? We're a community of farmers, not fighting men. If not for the war, we might have enough guards in the hold to protect the settlements. That the dragons should return now is most unfortunate." As he has been put in charge of handling people at Rorikstead, Jouane Manette has a large number of interactions with the residents of the village. Particularly noteworthy are his interactions with his secret apprentice, Sissel. Sissel: "I was just wondering. The next time we meet, do you think maybe you could teach me some fire magic? Nothing dangerous! Maybe a candle lighting spell?" Jouane: "By the Eight, keep your voice down! Do you want the entire village to learn our secrets?" Sissel: "Oh! I'm... I'm sorry. I didn't mean to upset you." Jouane: "Shh shh. It's fine, child. It's fine. But we must be cautious, hmm? What we do, the things I teach you. The others wouldn't understand." Sissel: "I understand. I'm sorry. I just get so excited thinking about it. So... can we. Do some fire magic?" Jouane: "Hmph. Most certainly not. But perhaps I can teach you how to put some candles out. We'll start there." Sissel: "Oooh, wonderful! I can't wait!" Jouane: "Today I'll teach you a useful spell that might just save your life. If you should ever fall into a river, you'll be very glad you learned it." Sissel: "Oh! Are you going to teach me how to turn into a mud crab?" Jouane: "Oh, it's much better than that. I will teach you how to breathe underwater, with no need to turn into one of those ugly creatures." Sissel: "Wow! Then I could dive into a river and swim so far away that Britte and father could never find me." Jouane: "Now, clear your mind and breathe deeply. Good concentration is very important for spellcasting." He will talk to Reldith about some brushes he recently acquired. Jouane: "I picked up a set of fine silver brushes in the city, Reldith. I thought you might be interested." Reldith: "How thoughtful! I'll come take a look after supper." Jouane will talk to Ennis about how he heard traders from Whiterun mentioning him. Jouane: "The last time I was in Whiterun, the tradesmen were talking about you. It seems your reputation as a businessman is growing." Ennis: "Glad to hear all my hard work has paid off. Maybe we'll fetch a better price for our crops next time we're in the city." Jouane will ask Erik if he needs anything during his next trip to the city. He will ask Lemkil if it would be alright for him to purchase Britte and Sissel some clothing from the city. He will also make conversation about farming with Rorik. Rorik: "Looks like we're in for quite a harvest. We've had better luck with our planting than any village in the hold." Jouane: "Luck? I think it has more to do with the hard work and good soil." Rorik: "Maybe you're right. Even so, I can't help wondering if some other force it at work here." Jouane: "The last wheat shipment fetched a fine price at market." Rorik: "Well done! I don't know where I'd be without you, my old friend." Jouane: "It pleases me to know that I can still be of use even in the twilight of my life." Rorik will also direct you towards Jouane to handle any business you have in Rorikstead: "If you've got some business in Rorikstead, you should start by speaking to Jouane." "Sorry, I don't mean to be rude but Jouane's the one who deals with people. I'm afraid I lost my charm years ago." If you ask Rorik about his service in the Great War he will confirm his status as a veteran and talk about how Jouane saved his life: "Aye, that I did. I commanded a force of several dozen men, most of them levies from villages in this part of the hold. I damn near met my end in that war. An Aldmeri soldier ran me through with his blade and left me for dead. A healer named Jouane saved my life. He's been my closest friend ever since. I tell you, that man is a miracle worker." Sissel will also mention how he is training her in the art of spellcasting: "Some day soon I'll stop being afraid. Jouane is teaching me magic. He says I'm real good." Despite him being a mage and his reported past as a healer, Jouane knows no spells. This issue has been addressed by version 2.0.7 of the Unofficial Skyrim Patch; he will use spells when in combat.